Rockville, Md. – From Sept. 15-25, Montgomery County executive Ike Leggett led a trip for four cities in China: Shanghai, Xi’an, Benxi, and the Gu’an County right outside of Beijing. The trip included over 80 business, education, and government leaders from Montgomery County and the DC metropolitan area including Montgomery County Public Schools (MCPS) superintendent Joshua Starr, county council member Hans Riemer, and Michael Goldman of the Washington Metro Area Transit Authority (WMATA). Members of the Montgomery County delegation to China at the Shaanxi Province hosted a business roundtable for the Montgomery County delegation. Pictured L-R: Minister of Commerce Mr. Yao Chaoying, Montgomery County Executive Ike Leggett, Director of Special Projects Lily Qi, and Councilmember Hans Riemer. This marked the first trade trip to china in five years by the county Executive’s office – the last one was in 2008. The purpose of this mission was to encourage Chinese investors to consider Montgomery County as an attractive location for their investments, open doors for MoCo businesses there, as well as establish a “Sister City” relationship with the city of Xi’an, said a press release put out by the Montgomery County Office of Public Information. “Our county is competing, especially in biotechnology and health sciences, with other states, cities, and counties that are also looking to tap into the Chinese market. For a tiny investment, we have made a significant impact,” Leggett said. As an immediate result of the trip Beijing based China Fortune Land Development committed to financially supporting a Rockville based public-private partnership called Biohealth Innovation, Inc. (BHI). BHI was started by Leggett and connects academic biomedical research with government and industry. “I am enthusiastic to work in partnership with CFLD and Chairman Wang’s team to implement two new important programs that will further develop the Montgomery County innovation ecosystem,” said Richard Bendis, President and CEO of BHI. The trip also brokered interchanges between Montgomery County’s education leaders and their counterparts in China. Winston Churchill High School in Potomac, Md. signed a Memorandum of Understanding (MOU) with its sister city school Xi’an No.1 Middle School. Representatives from Montgomery College visited Xi’an University and signed an MOU to form the broad framework for a partnership between the two institutions which will include exchanging visiting faculty, collaborative virtual online seminars or courses and more. The trip also formalized the sister city relationship between Montgomery County and Xi’an. The sister city program is part of a larger network called Sister Cities International, founded by President Dwight D. Eisenhower in 1956. Sister Cities International is a nonprofit, nonpartisan network that unites “citizen diplomats” and volunteers in programs in 140 countries on six continents. 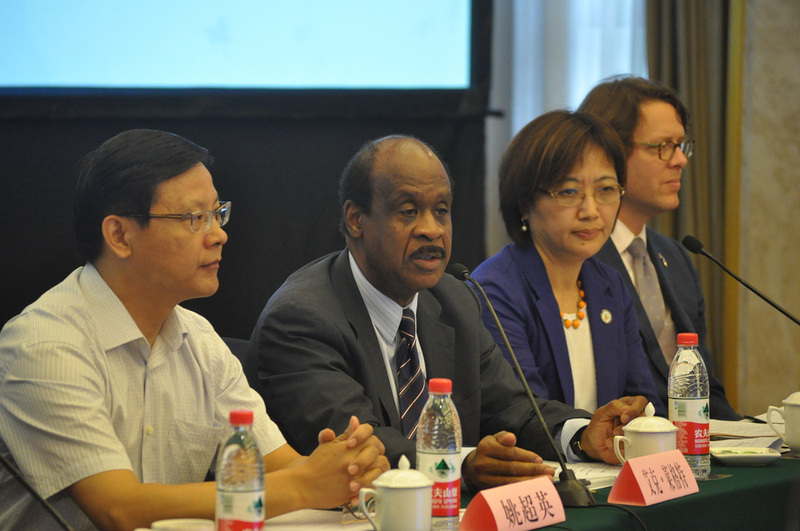 County Executive Ike Leggett (far left) led an 80-member trade and sister-city mission to China in September to advance partnerships with several cities. 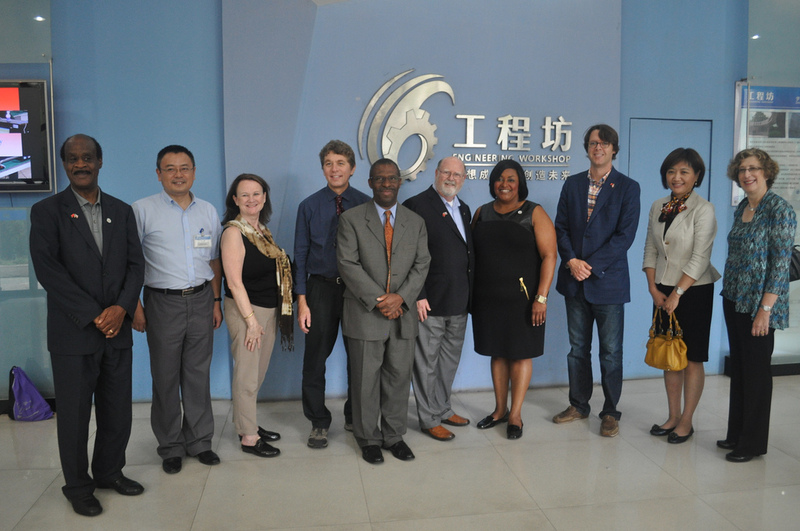 Pictured with Montgomery College president DiRionne Pollard (4th from right), Councilmember Hans Riemer and Montgomery County Director of Special Projects Lily Qi at the Xi’an Jiaotong University’s School of Engineering in the city of Xi’an, which is expected to be Montgomery County’s sister city in China. “This relationship will surely grow and strengthen cultural, educational, business, and trade exchanges between the two communities,” said Mary D. Kane, President and CEO of Sister Cities International. The mayor of Xi’an is scheduled to pay a visit to the DC area in March, when the sister city relationship will be officially commemorated. This entry was posted in community relations, global affairs, government cultural competency, innovation, life as an immigrant by Lily. Bookmark the permalink.